The Sibling Slam Book (2006) by Don Meyer. Don Meyer invited together a group of 80 teenagers, from all over the United States and abroad, to talk about what it’s like to have a brother or sister with special needs. 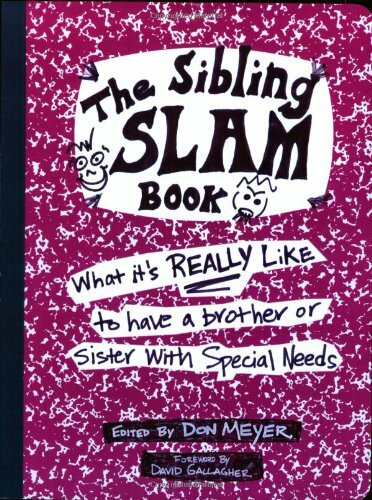 Their unedited words are found in The Sibling Slam Book, a brutally honest, non-PC look at the lives, experiences, and opinions of siblings without disabilities. Pp. 152.